But I am sick of hearing about Boris Johnson all the time and quickly turned the radio off. When will people realise that it’s only by denying this lying Brexit oaf the oxygen of publicity that we can finally stem the flow of falsehood that seems to stream endlessly from his filthy blowhole, day after day after day? Oddly, despite being in France, the whale appears to have chosen to communicate in English, observing current EU negotiating protocol. Doubtless all European cetaceans will revert to their original regional dialects when our glorious independence from those Brussels bureaucrat fat cats is finally enacted, unless the traitors triumph. I have often suspected the cetacean community could understand us a lot better than they let on. In 1993, I began writing my first solo standup hour in the splendid isolation of a remote peat cutter’s bothy on the Isle of Lewis, not far from the Callanish III standing stones, where Ultravox filmed the video to their 1984 single, One Small Day. I had become fixated on the idea that although critics assumed standup audiences were laughing at an alternative comedian’s subject material – farts, periods, Thatcher etc – what was more profound was the extent to which they were actually subconsciously affected by changes in a comedian’s speech rhythms, which subtly tickled the laughter out of them, irrespective of content. But, I wondered, would an audience of sentient, but not culturally literate, beings appreciate this strategy? I rowed out on to the midnight Minch and emptied a bucket of fish into the choppy waves to attract the dolphins, who soon gathered around my boat, already a more appreciative audience than can be found in, say, the entire city of Carlisle. Through a purloined megaphone I performed two routines to the attentive sea creatures; the first a long story of being visited repeatedly by Jehovah’s Witnesses, which relied on the audience knowing who both the actor Robert Powell and the proto-grunge band the Jesus Lizard were; the second a shambling improvisation around a poster of a kitten playing the piano, the actual words largely irrelevant, the humour derived essentially from micro-managed tonal and rhythmical shifts. Needless to say, the patient cetaceans were left cold by the first bit, but clapped their flippers and clacked their tongues enthusiastically to the second, just as an audience of Scots at the Edinburgh fringe were to do the following summer, where, typically, I was overlooked for the main award as usual. Never mind. In the world of the dolphins I was a player. It is the killer whale, however, which has always been my favourite cetacean, ever since an ill-advisedly youthful exposure, at the age of nine, to Dino De Laurentiis’s violent and horrific eco-thriller Orca: The Killer Whale. I duly noted that the pornographic elements of Arthur Herzog’s source novel, which I had already read, were absent from the screen adaptation, but this was more than made up for by Richard Harris’s unexpectedly brilliant portrayal of a drunken Irish fisherman, surely a high-water mark in a career characterised by impossible and unpredictable versatility. 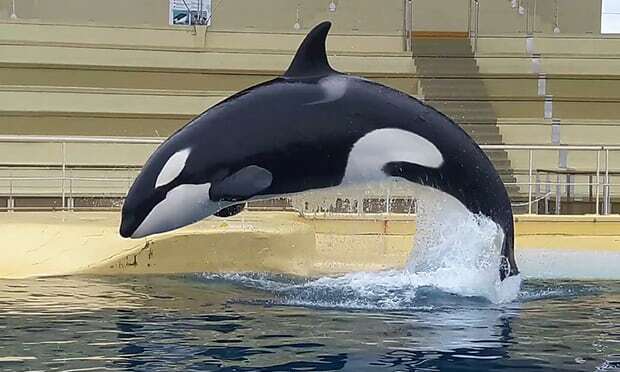 By Wednesday night on the day of the whale revelation, I was on a train to France, arriving at the animal park where Wikie was held at around 3am and soon scaling the typically weak French fence. I flopped on to the concrete by the side of his silent pool, my shadow cast against a bank of seating by a lone security spotlight, and suddenly the whale’s great black-and-white head rose from the water to greet me. “Because,” replied the whale, after a thoughtful pause, “up until fairly recently, everything has been quite satisfactory. Now, if you please, the kitten piano bit.” I got up, stood before the enormous sentience and began.